How long have you been CrossFitting: I started 2 years ago when CFF8 changed over from the old Intermix Fit Club. How is your free time spent: Most of my time outside of work and CrossFit is spent shuttling my kids to activities and being involved with their school. PTA meetings, class parties, music lessons, soccer practice… I actually love every minute of it! I like to spend time with my husband, travel (or plan trips), shop, and engage in long texting conversations with some of my fellow CrossFitters. I also like to plan parties and theme days for the 6 am class. Athletic background: I have zero athletic background and have never played an organized sport. One day I walked into Lifetime (where I had been a member for years and barely went) and signed up to work with the trainer who happened to be sitting at the desk that day. It was very expensive and too hard logistically because of my kids. I joined a boot camp at 6 am so I didn’t have to get a sitter for my kids, and realized that working out at 6 am made the rest of my day go so much more smoothly. Contrary to popular belief, I am NOT a morning person. How has CrossFit changed your life, lifestyle, level of fitness? I don’t even know where to begin. A few years ago I couldn’t run a mile, couldn’t do a pushup, and doing squats with 10 LB dumbbells was hard for me. In October, I did the Heroes on Hines and Detroit Free Press half marathons and can now squat way more than 20 LBs! My pushups aren’t “perfect” but they’re getting there. My clothes fit better, I feel better, and most importantly I feel like I’m setting a good example for my kids. Tell us something most people wouldn’t know about you: I was born in England and didn’t become a US citizen until I was 13. I’ve traveled to every continent except Africa and Antarctica. Name at least one embarrassing guilty pleasure: I love everything Real Housewives and Kardashian. Goals for next year: I have the WORST mobility. I need to set aside time every day to work on mobility outside of the gym, which will help me in all aspects of my life including CrossFit. 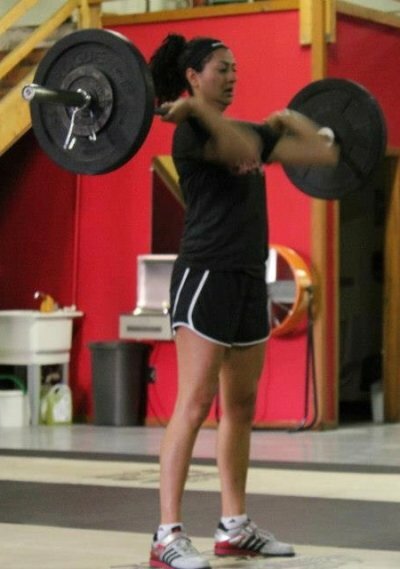 Rimi has been with CFF8 since its inception and has grown so much as an athlete over the past two years. Her gains in running alone are phenomenal let alone her progress with weights and Olympic lifts. Rimi really embodies the everyday CrossFitters; she juggles the responsibilities of raising a family, managing a career and still finds time to make it to CFF8 every day with a positive attitude; don’t know how you do it! She is definitely an important member of the 6am class and I know for sure those early morning workouts aren’t the same without her. As coaches, it’s great to see someone who doesn’t consider themselves an athlete or have an athletic background have so much success with CrossFit. Keep with the dedication, Rimi!